Houston is the riskiest market this winter, with a 36 percent chance that home prices would decline within the next two years. “Low oil prices and the strong dollar have put a dent in Texas’ job growth,” said Mine K. Yücel, senior vice president and director of research at the Federal Reserve Bank of Dallas. However, a more diversified economy in Texas means this isn't the disaster it once might have been. Reposted with permission from RealtyTrac’s Housing News Report. With oil prices plummeting below $30 a barrel, the gleeful mood of recent years has turned glum in West Texas, the Gulf Coast and the Eagle Ford shale formation area of Texas as the frenzy of shale oil drilling has come to a screeching halt. As prices of crude keeps plunging and the oil and gas layoffs mount, more and more bad news is coming from Texas’ real estate markets. As the oil rig counts drop in the Permian Basin in West Texas, so too do local real estate prices as the hydraulic fracturing, or fracking, boom turns to a bust and gasoline prices plunge from over $100 a barrel a year ago to less than $30 now. 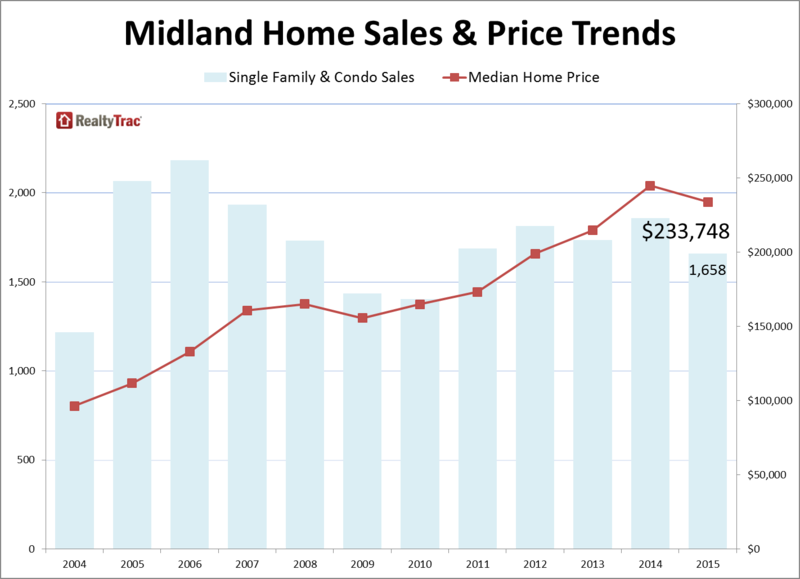 Meanwhile, home sales are down sharply in West Texas cities of Midland and Odessa. Home sales have also slowed in Houston and El Paso, not to mention North Dakota. Home sales are down sharply in West Texas cities of Midland and Odessa. According to a recent report by Arch Mortgage Insurance Co., oil prices — not mortgage interest rates — may be housing’s biggest risk. Five Texas cities — Houston, Austin, Dallas-Plano, Fort Worth-Arlington and San Antonio — rank at the top of AMI’s housing risk in the 50 largest metropolitan areas. Houston is the riskiest market this winter, with a 36 percent chance that home prices would decline within the next two years. Austin, Dallas-Plano, Fort Worth-Arlington and San Antonio all clocked in at a 26 percent risk of falling home prices. “Most Energy Patch states will experience slower economic and home price growth and a few areas may even see outright home price declines,” the report claimed, referring to oil or gas-producing states like Alaska, North Dakota, Wyoming and West Virginia, Louisiana, New Mexico, Oklahoma and Texas. The Dallas Federal Reserve recently estimated that falling oil prices and other factors would reduce job growth in Texas overall from 3.6 percent in 2014 to as low as 1.1 percent by November 2015, or a reduction of about 149,000 jobs created. The Dallas Fed said the decline in oil and gas prices, the tight labor markets and weakening exports, would dampen Texas’ economy. While some are already predicting that the sun is setting on the Texas miracle, recent history suggests otherwise. Global oil prices spiked in the summer of 2008 to an all-time high of $133 a barrel, then plunged to $41 a barrel when the economy crashed and went into recession. That price drop was even more dramatic than the oil bust of 2014. And 30 years ago, oil prices went into a free fall, declining from over $30 a barrel in 1985 to nearly $10 by July 2006. Mark G. Dotzour, a former chief economist at the Real Estate Center at Texas A&M University at College Station, Texas, said the Texas economy is slowing down, but it is still growing. He said the growth is uneven in the state’s four major metropolitan areas, namely Austin, Dallas, Houston and San Antonio. “In October 2014, Houston was hit like a thunderstorm when OPEC decided to declare war on the U.S. oil industry,” said Dotzour, referring to the Organization of the Petroleum Exporting Countries (OPEC)’s landmark decision not to cut oil production leaving 30 million barrels per day unchanged. The oil cartel’s goal was to bring oil prices down, in order to make the extraction of shale oil in Texas less affordable. The #Texas economy is more diversified today, compared to the last oil slumps. Dotzour said the Texas economy is more diversified today, compared to the last oil slumps of the mid-1980s and 2008. As of 2013, oil and gas accounted for only 13 percent of the income generated in the state, and only 2.5 percent of the jobs, according to a 2015 Federal Reserve Bank of Dallas report. Last year, Texas grew by 5.2 percent, more than any American state beside North Dakota and more than double the growth rate of the United States overall, according to the Texas Comptroller. Read the full story in the Housing News Report.